Your bedroom is where you go to relax at the end of the day, perhaps by reading a book or catching up on your favorite show before bed. It’s also where you enjoy lounging on those weekend mornings, sipping on a cup of coffee while you check social media. Your bedroom should be comfortable and inviting, and the lighting in your bedroom goes a long way in providing the atmosphere you need. At Hacienda Lighting in Scottsdale, we can help you find the perfect lighting options for your home. The ceiling fixture in your bedroom should provide enough light for the entire space, but it shouldn’t be the only fixture in the room. 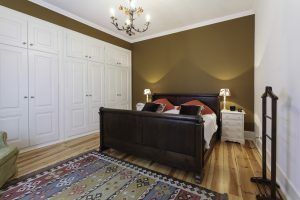 A ceiling fan with a light kit can suffice, but if you have high or vaulted ceilings in your bedroom, a hanging fixture or small chandelier can also be ideal. It’s important for rooms with high ceilings to have light that is focused both upward and downward, so there aren’t too many shadows in the upper and lower portions of the room. When you’re reading a book before bed, or checking the latest news on your phone or tablet, it’s important to have a table or wall lamp to provide enough light to protect against eye strain. Also, you’ll have most likely turned off the ceiling light, or lowered it with a dimmer switch, and having a lamp or wall light will help you see should you need to get out of bed. If you’re shopping for new bedroom lights, come to Hacienda today!